Not just student musicians: The Saint Rose Orchestra, here, performs with Livingston Taylor at the Massry Center. The orchestra is the first college group to do so . Before acclaimed jazz saxophonist Steve Wilson brought his trio to the Massry Center for the Arts, Tom Bystryk collaborated on a press release, took part in a radio interview and picked up the musician at the train station. Before pop/folk artist Livingston Taylor gave his recent Massry Center performance, he needed eight measures of improvised fiddle. That job went to violinist Jahna Stanton. Such tasks are all in a day’s work for professional musicians and artist managers. But Bystryk and Stanton are Saint Rose music students. And just as biology majors conduct research in the science labs and art students paint and sketch in the studios, those who come to the College of Saint Rose to study music make the Massry Center their classroom. Their classroom also happens to be a critically praised – and very popular – regional venue. 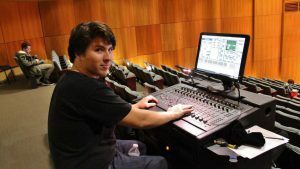 Tom Bystryk, a ’17 music industry major, works the Massry Center sound board before the December 2016 concert by jazz saxophone great Steve Wilson. In the nine years since it opened, the Massry Center has welcomed the likes of B.B. King, Dave Brubeck and Chick Corea. The eclectic Premiere Performances series has built up a loyal following. But the center is foremost a learning space for Saint Rose students pursuing a degree in music, music education or music industry. 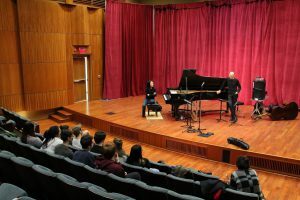 Professional concerts in the 400-seat Kathleen McManus Picotte Recital Hall are scheduled around student recitals and appearances by the 32 or so College ensembles. And when well-known artists appear, music students frequently play a role, on or back stage. 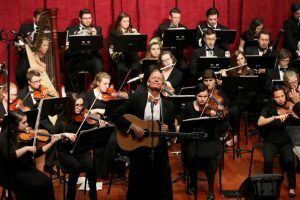 When Livingston Taylor first performed in the Massry Center in 2013, the Saint Rose Orchestra became the first college ensemble ever to join him on stage. Now, music industry students have produced a whole show. Hartmann, who manages Steve Wilson, put her class in charge of his December 9, 2016, engagement with bassist Ira Coleman (who also teaches at Saint Rose) and pianist Helen Sung. Students handled budgeting, publicity, advertising and hospitality, along with lighting, sound and other show logistics. Bystryk helped classmates write (and rewrite) a press release. He took part in a radio interview and said he felt the weight of having to fill the seats. When he met Wilson at the train station, he thought about how to approach a guest artist. 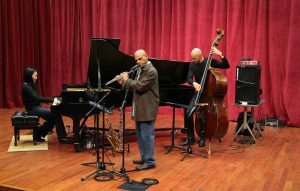 Saint Rose students didn’t just watch jazz trio Helena Sung, Steve Wilson and Ira Coleman. They helped produce the performance. Bystryk, who also assisted with sound, said after getting to know the musicians and seeing their show that he was astounded by their artistry – and the fact that the trio did not miss a beat when Sung filled in for ailing pianist George Cables. Making a personal connection with musicians is not unusual here. Once, for example, a group of horn students found themselves taking an impromptu master class from legendary trumpeter and band leader Doc Severinsen, whom they encountered practicing in a Massry Center stairwell before a show. And last fall, the Saint Rose Orchestra joined Taylor in concert for the second time. A professor at the Berklee College of Music, Taylor put them at ease. Nonetheless, the student musicians were well aware the audience was not coming for a student performance – and that the seats would be filled with more than just their families and classmates. For days before the show, she worried the orchestra would not be up to the task. Stanton was floored, then, by how quickly the ensemble raised its level for the dress rehearsal with Taylor. Still, she was handed the surprise of a lifetime when Taylor asked for a good 25 seconds of improvisation for a railroad-inspired piece and orchestra director David Bebe chose her. “I’m not what you call a fiddler,” Stanton explained. “I had to completely get rid of my classical technique on the spot. Then, the next night backstage I couldn’t remember what I had played and had to do it all over again.